Think it’s too late to straighten your teeth? Perhaps you aren’t willing to undergo months or years in metal braces as an adult. Now there is an orthodontic solution that you can feel good about. Invisalign is a revolutionary treatment designed to give adults the opportunity to straighten their smile with minimal sacrifice to their lifestyle. Whether you are a soccer mom or corporate professional, Invisalign is an effective treatment option that is discreet, convenient and comfortable. Invisalign relies on a series of clear aligners that move your teeth into ideal position over time. Each set of aligners are custom fit to your smile and changed out every couple of weeks to ensure your teeth keep moving in the right direction. Invisalign has been proven effective for teeth that are crowded, widely gapped and crooked. It can also correct underbites, over bites and crossbites in most cases. In fact, Invisalign typically makes orthodontic corrections at a much faster pace than traditional braces. Discreet – The aligners are made of clear, thin plastic. This makes them virtually invisible to others, a top perk of choosing Invisalign. Convenient – Unlike braces, Invisalign aligners can be removed for eating, brushing and flossing. This is a remarkable advantage that can allow you to eat the foods you love and keep your teeth and gums clean and healthy during orthodontic treatment. Comfort – You can expect your aligners to be made of smooth and comfortable plastic. They won’t irritate your gums or cheek like metal braces, and they don’t need frequent adjustments or tightening along the way. In fact, your number of office visits will be just a fraction of those required for traditional orthodontics – and you won’t walk away with a sore mouth! 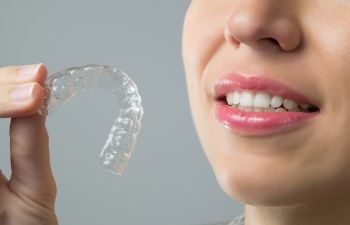 If you’d like to learn more about Invisalign or find out if this clear aligner therapy is right for you, call Kennesaw Mountain Dental Associates. We love giving patients the ability to gain a healthy, confident smile without enduring bulky metal braces. Reasons to Replace Missing TeethAre You Afraid of the Dentist?